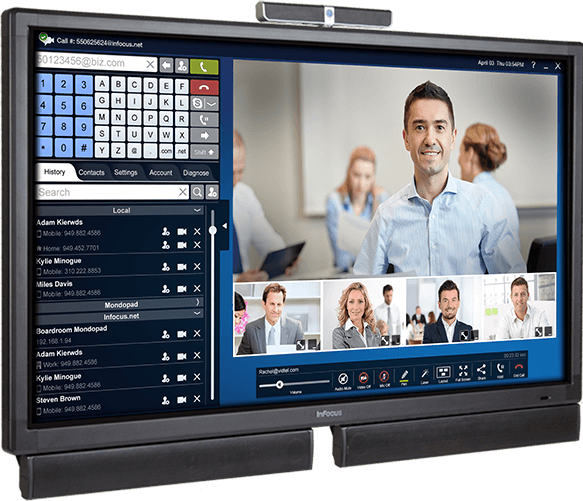 Display, annotate and whiteboard on a InFocus Mondopad 57-inch touchscreen with meeting participants in the room and around the world. An InFocus Mondopad puts everything you need to visually present, capture and share ideas at your fingertips – all beautifully integrated into a single device. Connections HDMI x 3 (2 inputs, 1 output), USB Type-A x 7 (4 USB 2.0 and 3 USB 3.0), USB Type-B x 1 for Touch Control, Ethernet (RJ45 x 2), RS232 input, Component, Composite, VGA, 2 x 3.5mm Stereo Mini Jack (1 microphone pass through, 1 for video), 1 RCA stereo audio in, and 1 RCA stereo audio out. Product Dimensions HxWxD 40.7 x 56.7 x 3.7in. Shipping Dimensions HxWxD 42.5 x 63.5 x 10in.